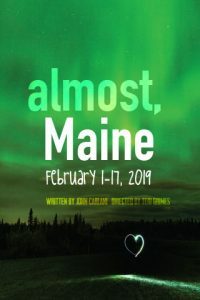 One cold, clear, winter night, as the northern lights hover in the star-filled sky above, the residents of Almost, Maine, find themselves falling in and out of love in unexpected and hilarious ways. Knees are bruised. Hearts are broken. But the bruises heal, and the hearts mend—almost—in this delightful midwinter night’s dream.